The Winter Poker Championship Seefeld 2017 is set to run from February 16 to February 26 and online poker players are being offered the chance to win a prize package into the Austrian tournament series’ main event for as little as $3.30. Set to take place in the picturesque Austrian ski resort town of Seefeld, which is located approximately 16 miles northwest of the city of Innsbruck, the Winter Poker Championship Seefeld 2017 will feature a €2,160 ($2,286) buy-in no-limit hold‘em main event that is expected to have a prize pool approaching €755,766 ($800,000). For those eager to compete but unable or unwilling to pay the full buy-in, Intertops Poker and Juicy Stakes are to run month-long and three-step online poker satellite series from Wednesday that are to hand out prize packages worth $4,000 prize into the main event of the Winter Poker Championship Seefeld 2017. The pair revealed that the winners will receive their full main event buy-in alongside travel and accommodation expenses. 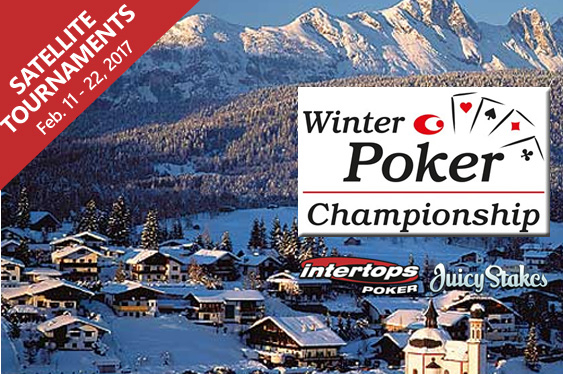 “Players can enter Winter Poker Championship Seefeld 2017 online satellite tournaments under the tournaments tab in our poker software,” read a statement from Juicy Stakes and Intertops Poker. The Horizon Poker Network sites additionally declared that this weekend will see them run a special promotion offering doubled reload bonuses. To take advantage of this campaign, Intertops Poker players should enter the coupon code ‘CAPT2017’ while ‘AUT2017’ is the code for Juicy Stakes. Juicy Stakes and Intertops Poker will be running three-step online poker satellite tournament series until February 22.